It’s senior year for Kevin Conners and his main goal is getting a full ride hockey scholarship to Michigan State. He’s slimming down and muscling up with extra trips to the gym and a diet of protein bars and shakes, but when Kevin fails an assignment for PE class because of his poor diet, coach sends him off to make extra credit in Domestic Tech class by learning to cook. Kevin’s got to do some fancy footwork to be sure his friends don’t learn about his assignment, and he’s practically pirouetting to ensure that they don’t find out about his connection to Claire, the kitchen goddess who has been assigned to help him. Claire’s everything that’s attractive to Kevin she’s curvy and beautiful and smart and a fantastic cook to boot, nothing like the skinny cheerleaders that his best friend Victor is into. Unfortunately, Kevin is sure Victor won’t understand, so he’s got to work extra hard to keep these two parts of his life apart. The Jock and the Fat Chick takes some normal teen problems and sets them on their ear. Driven by ambition and peer pressure, Kevin is a male athlete making poor eating choices driven by the way his body looks. Claire, on the other hand, is a strong character, a leader to whom others go for advice who is comfortable in her own skin. I loved everything about this book except the title, but the title is fitting in its way, because this is a story about stereotypes and expectation. It’s about seeing high school stereotypes for what they are and being strong enough to choose a different path. It’s about choosing the life and the love that is right for you, not the one that’s expected by others. Nicole Winters has written a fun romance that will have you rooting not simply for the success of the relationship, but for the success of the two realistic teens her story presents. One warning: don’t start to read The Jock and the Fat Chick without some snacks laid in because the food descriptions will have you ordering take out for delivery in no time. 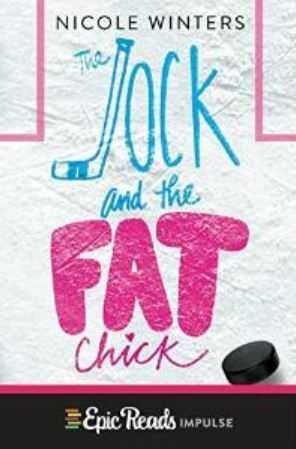 I received a copy of The Jock and the Fat Chick from the author in exchange for an honest review.